Samsung Pay and Google Pay (formerly Android Pay) are digital wallets systems that allow you to pay for goods in real life and over the internet without using a physical credit card to complete the transaction. They work the same way, but they are different systems. Here’s how they compare. Samsung Pay is a contactless mobile payment app built into most newer Samsung smartphones that support NFC (near-field communication), including most of the Galaxy S series. It's also compatible with the latest Samsung smartwatches, including the Galaxy Watch. The Samsung Pay app is not compatible with non-Samsung devices, though. Has technology that works with most credit card machines. Can use PayPal for in-store purchases. Available only on Samsung devices. In addition to NFC, Samsung Pay also uses a technology called magnetic secure transmission (MST), which puts out a signal that mimics the magnetic strip on a credit card. The benefit of MST technology is that any payment terminal that takes credit cards can take Samsung Pay. Mobile payment apps without MST technology are compatible only with terminals that have been upgraded to accept contactless payments. You can store all of your credit and debit cards in Samsung Pay as well as loyalty, membership, rewards cards, and gift cards. In stores, you can also make purchases via PayPal by connecting your account to Samsung Pay. Samsung Rewards, available to all Samsung users, lets you earn rewards and enter sweepstakes for big prizes; Samsung Pay users get access to an exclusive catalog of awards. 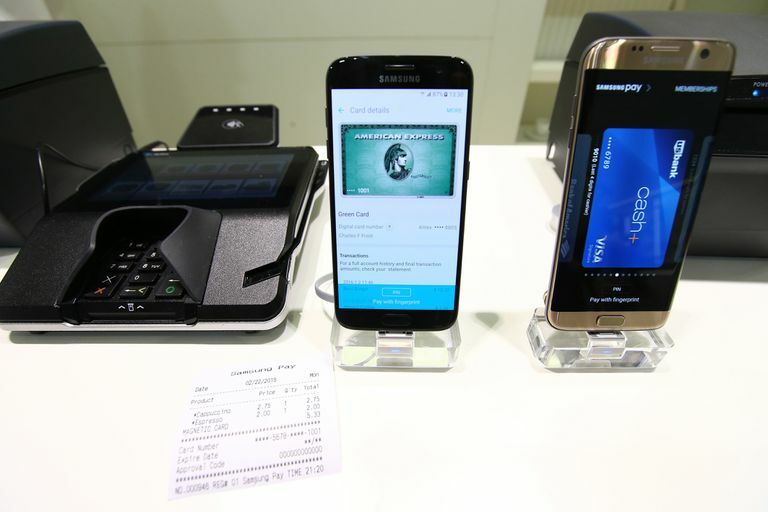 You can also make online and in-app purchases using Samsung Pay. Google Pay, available on Android, desktop browsers, and on iOS*, lets you pay for purchases as well as reimburse friends and family for expenses, and receive payments too. Like Samsung Pay, you can store your credit and debit cards as well as connect it to your PayPal account. You can also load up loyalty and gift cards to your account for use in the mobile app. Users can also store movie and event tickets as well as coupons, and in some cities, you can save your transit pass in Google Pay. Compatible with most newer Android devices. There's an iOS version of the app. Can connect your account to PayPal. Can also pay friends and family using the app. Apple users can't use it for in-store purchases. Formerly known as Android Pay, the Google Pay app is compatible with smartphones running Android Lollipop 5.0 or later and iPhones running iOS 9 or later. The app is also compatible with Wear OS smartwatches; check the list of apps on your watch to see if Google Pay is pre-installed. If it's not, then your watch doesn't support Google Pay. Samsung Pay is available only on Samsung devices. Google Pay is available on most Android smartphones, including Samsung devices. Some of Google Pay's functionality is also available on iPhones. You can use Samsung Pay on any payment terminal that accepts credit cards. You can use Google Pay only on terminals that accept contactless payments over NFC. You can also use Google Pay to send and receive money to and from friends and family. Google Pay is available on desktops. So which should you choose? If you use Samsung smartphones and travel to remote places that may not have upgraded their payment terminals to accept contactless payments, Samsung Pay is the way to go. Otherwise, Google Pay is a good choice for Android users who want one app for paying friends and family members and at the register. Finally, Samsung users can take advantage of both apps – no reason to choose just one.